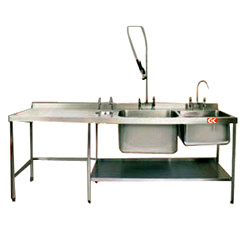 Our team of experts is engaged in manufacturing and exporting a unique range of Commercial Sink Unit. This unit is used in most of the commercial kitchens for cleaning and washing the utensils and other kitchen accessories. It is available in different sizes and designs to fulfill the requirement of the clients. Also, it is easy to install and is presented at the best rates in the industry. Manufactured using high grade stainless steel. Available with proper provision for taps nad other outlets. Backed by an extensive experience, we are a prestigious Consultant,Designer, manufacturer and supplier of Commercial Kitchen Equipment & Kitchen Machineries,food processing machines .Cooking Mixer Machines,Cooking Equipments & Machines,Vegetable cutting machines,wet grinder,cutter mixer,dough kneader,instant rice grinder,,Steam cooking units & steam vessels,Combi steamer,Commercial Kitchen Equipments,Bakery Machineries,chapati Making Mahine,Halwa Making Machine,Mysore Pak Making machine,Khoya Making Machine,Indian Sweet Making Machine,Murukku,Seva,Namkeen,Papad Making Machine,Amla Processing Machines,Sugarcane Juice Machine,Samosa Making Machine,Idiyappam Machine,Dosa Making Machine,Banana Slicer,Blenders,Pulverizers,Commercial Dishwashers,Refrigerators & Freezers,Food Processing Machinery,Kitchen Exhaust Systems,Sink Units,Gas Burner Range,Food Serving Equipments,Dining Equipments,Work tables,Trolleys,Racks etc etc. These products find a wide application in Hotels,Restaurant,Catering , canteen,Food processing industry,Ayurvedic Industry, hospitals kitchen like all bulk cookings. These facilities help us to offer quality products in enormous volume. Our sophisticated machines also allow us to fabricate a qualitative range of products as per the specific requirements of our clients. Furthermore, we use fine stainless steelwhile manufacturing the products, in order to ensure supreme quality. Our quality approach and wide distribution network have enabled us to meet the demands of our valued clients based across the country.